I was going through some old photos the other day and found a cake I hadn’t shared with you yet. 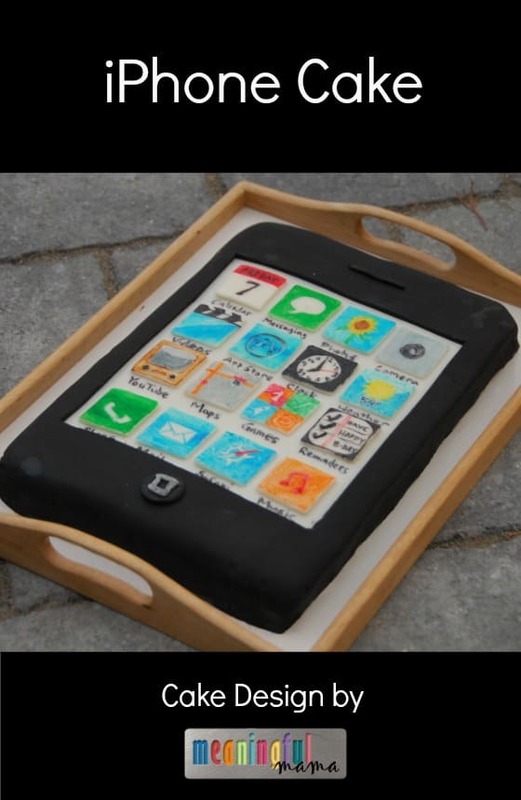 It was the cake I made when my husband got his first iPhone – my iPhone cake. I thought it would be fun to add it to my collection of cakes that I’ve done in the past. I actually found quite a few cakes that I’ll be adding in the near future. This is some of my old work, so I don’t have great photos, but I still wanted to pass along the image in case anyone is inspired and wants to create their own iPhone cake. How did I make it? I baked a rectangular cake and covered it in white fondant. Then, I covered it in black fondant. I used an X-Acto Knife to cut out the rectangle from the top. After you make the cut, it’s easy to peel away the black rectangle. You can add a bit of corn starch to the top of the white fondant before covering it in black to prevent sticking. I made little squares to fill up the cake. Then, I used food decorating pens to draw all of the little iPhone symbols onto the squares. I added details to the black parts of the fondant to make it look like the original phone. Of course, the phones and app signs look different now, so you’ll have to adapt your own designs for the current technology. Enjoy your baking and decorating.